DC Ghost Tour | These haunted historical accounts will lead you through a journey into America’s past. Are you ready for the ultimate historic ghost walk, the DC Ghost Tour? Our ghost stories provide a new perspective on the real history behind the hauntings found in our nation’s capital city. From first-hand accounts to the true tales behind the haunts, guests of our tour will gain a real understanding as to how D.C. is both a historical city and one of the most haunted places in the US. In Washington, D.C., the ghosts of presidents and first ladies, slaves and military personnel can all be found wandering the historic sites of the capital city. Arrive for an after-dark tour to walk among these spirits, hearing their tales of woe, despair, and assassination. Welcome to Washington, D.C, the most haunted historically significant city in the United States. We like to caution our guests of the DC Ghost Tour to keep an eye out during the tour as spirits may make contact. Our guides are trained to monitor and oversee the ghost walk experience, but it is up to you to stay vigilant and hopefully catch a glimpse of a ghost or two. Each of our guides is trained extensively before they begin escorting guests through the haunted capital city. Join our DC Ghost Tour and see famous sites within Washington D.C. including the Dolly Madison House, the Hay-Adams Hotel, and the National Theater. We offer customized group tours for a more personal, VIP experience as well as our traditional ghost walk. The DC Ghost Tour Difference: What Sets Us Apart from the Rest? Our haunted ghost tour is about the terrifying truth. Our tour stops have been heavily researched, and we provide real accounts of historical events as well as the hauntings associated with each location. We do not focus on gimmicks or jump scares like some tours may do, but instead, focus on authenticity and creating a memorable experience for our guests, whether you are locals to the city or tourists. Our goal is to explain the strange and unique stories found only in D.C, including the historical information related to the spirits that reside in the capital city. DC Ghost Tour welcomes you to a historic look at the haunted past of the capital city. Let our knowledgeable guides take you on an adventure to 8 locations in D.C., visiting the most haunted locations on a 1-hour tour. We encourage our guests to stay alert during the walking tour as you never know when there might be a ghost sighting! Our ghost tour is created to be scary and creepy but is still family friendly and available to all ages. Your kids will be talking about this exciting our for years to come! 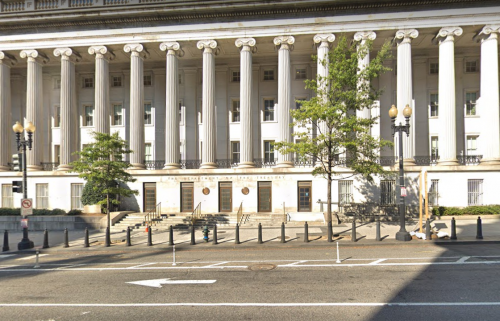 Tours meet and end behind the Treasury Building at the intersection of 15th Street NW and F Street NW. Look for your tour guide, who will be standing with a lantern. Click here for directions. The tour lasts roughly 1 hour across a 0.7 mile route. The ghost tour includes 8 locations across a short walking distance under one mile, and lasts one hour. Tours are held at 8pm and 9:30pm. Please only attend the tour for which you are scheduled. We recommend that you arrive for your ghost tour 10 to 15 minutes before start time. Tours are held rain or shine, so dress accordingly! Guests may only attend a tour for the day and time reserved. Changes are subject to availability and are not guaranteed. If a change is needed for your tour reservation, please email contact@dcghosts.com for further assistance. Tickets for our DC Ghost Tour must be purchased in advance and can be found online at our website. Tour guests are not required to print out tickets. Simply bring your ID and show up ready to start the tour! You do NOT need to print tickets purchased online. Once your order is made online, you’ll be added to the list! You must attend the tour for the date and time of your purchase. Rescheduling may be done upon approval and may be subject to a 10% rescheduling fee. Parking is limited in Washington, D.C. The closest and cheapest parking location is a parking garage located at 1620 I St NW. Sana was an awesome guide!!! I highly recommend this tour, the guide was very knowledgeable and friendly. our guide, jennifer was one of the greatest weâ€™ve ever seen. she kept it light and fun with her own personal jokes and antidotes. The tour was so much fun! Jennifer is such an engaging storyteller. Weâ€™ve been on 8 different ghost tours across the country and this was by far one of the best. Sana was our guide and she is incredible! Our tour provides a quality ghost walk experience for all ages, with a mix of history and spookiness rolled into one. DC Ghost Tour is both entertaining and informative. Our guides tell you the stories of our nation’s capital and how they are connected to spirits still lingering today. An Authentic Ghost Tour Based on Facts from our nation’s capital. This tour provides an exact account of what happened to certain individuals in DC history. Stories are a combination of historical events as well as eyewitness information. What is more thrilling than a ghost tour? Feel your heart race as you learn more about each tour stop, perhaps even seeing movement in the dark as you walk along the guided path. Are you traveling to DC and want to enjoy a fun family-friendly event? This tour is perfect for kids and adults, and we ensure everyone will have a great time. Learn New Stories about the Capital City. During the DC Ghost Tour, you will learn new and exciting information about the capital city. Travel back home to tell your family and friends about the famous stories as well as lesser-known tales you learned during the tour. The ghost tour is fun, even for the non-believer. Whether you believe in ghosts or not, you will enjoy the stories told and learning more about each historic location. In Town and Not Sure of What to Do. Whether you are traveling to D.C. for a week or just a few days, the DC Ghost tour is a great option for spending time in the capital city with friends, family members or co-workers. DC Ghost Tours offer you a memorable experience. The tour brings everyone together as stories are told about amazing moments in history. Have fun remembering the highlights of the tour long after your visit is through. Sign up for the DC Ghosts newsletter for updates on tours, discounts, and other scares. © 2019 Copyright DC Ghosts. All rights reserved.